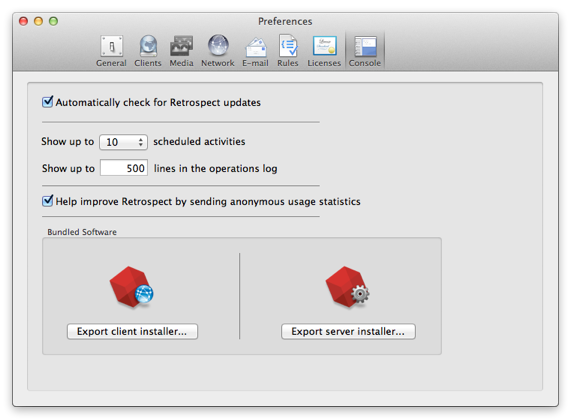 Retrospect has a number of built-in tools to help with tracking down problems. Our support team might ask you to send them configuration files, turn on debug logging or increase the log level, edit a retro.ini setting. These instructions walk through how to do both. Do not modify the files unless our support team instructs you to. Note – These instructions apply to Retrospect for Mac 8.0 or higher and Retrospect for Windows 7.7 or higher. These config files are compatible with Retrospect for Mac 8.0 or higher and Retrospect for Windows 7.7 or higher. 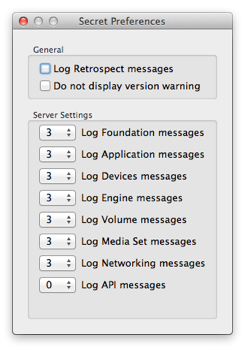 On the Mac, the Log window only shows the last 500 lines of the log by default, indicated at the top of the window. For instance, it might say [Showing 500 lines out of 21325]. 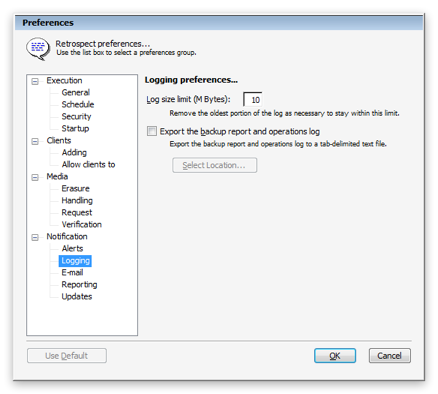 To change this setting, open Preferences > Console and change "Show up to __ lines in the operations log". To increase the logging level or turn on debug logging for the server, open Secret Preferences with one of the key combination below. For the client, follow the instructions below. Our support team will give you instructions about what options to change. The changes will be effective immediately; you do not need to restart the application. Mac Client — Open System Preferences. 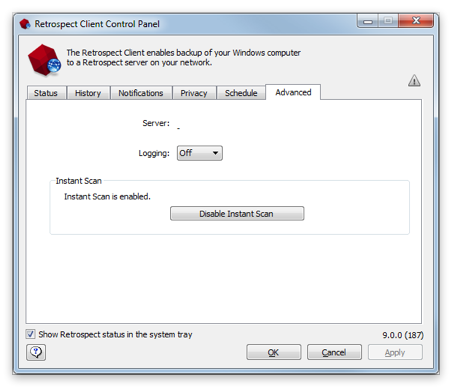 Hold down the command key and click on "Retrospect Client". Select "Advanced" tab. Windows Client — Hold down the control key for three seconds. The "Advanced" tab will appear. You can adjust the maximum file size of the log in Preferences. 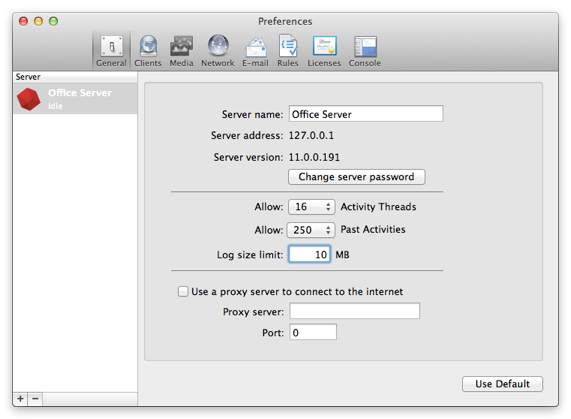 Turn off the server by either quitting the Windows application or using System Preferences on the Mac. Open retro.ini in Notepad or TextEdit. If our support team suggests turning on "device logging to 6", change SetDevicesLogging=3 to SetDevicesLogging=6. Save the changes to retro.ini. 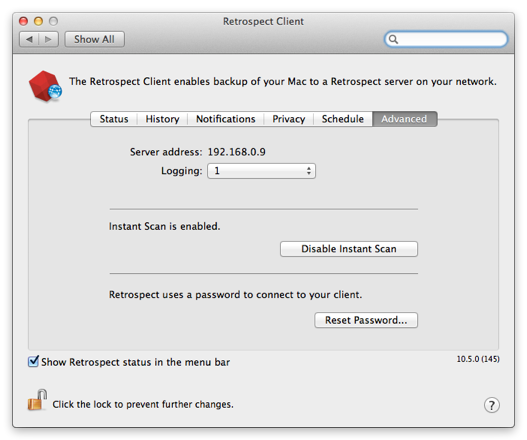 Turn on the server by either launching the Windows application or starting it through System Preferences > Retrospect on Mac. Be sure to change the setting back after you’ve reproduced the issue. For grooming, messages are logged to the Operations Log and Execution Log. However, for detailed debugging information, you can enable a grooming log by creating a file with a specific name next to the catalog file for the set you’re grooming: "Media Set A.rbc.grm.log" if you are grooming "Media Set A". This log is limited to 1GB, and you do not need to shutdown the engine to create it. On Windows, navigate to the catalog’s folder and right-click to create a text document. Name it Media Set A.rbc.grm.log. On Mac, open Terminal, navigate to the catalog’s folder, and run touch "Media Set A.rbc.grm.log". For diagnosing issues with proactive backup, you can enable a specific log for this feature to send to our support team. You will need to shutdown the engine before creating it. On Windows, navigate to the application’s data folder in "C:/ProgramData/Retrospect/" and right-click to create a text document. Name it proactive_backup_log.utx. On Mac, open Terminal, navigate to the catalog’s folder, and run touch "/Library/Application Support/Retrospect/proactive_backup_log.utx".